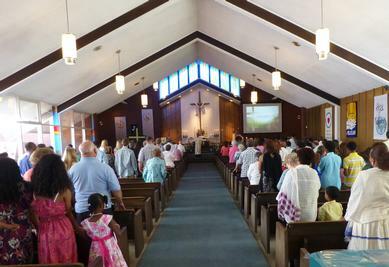 Sunday mornings are a busy time for us at Good Shepherd! We have our blended worship service at 9am, followed by a time of fellowship over coffee and donuts in the fellowship hall. Good Shepherd then has its Eritrean service at 10:45am, followed by a Korean service at 11:45am. Communion is served on the 1st and 3rd Sunday mornings, and the 2nd and 4th Saturday evenings of the month. We also offer Sunday School for all ages, including teenagers and adults. Children are very welcome in our services! We invite you to bring your family to join us in worship on Sundays.